The cabins in the Oaks Resort area near Pigeon Forge are perfect for a cabin vacation off the beaten path. Located just off of Hwy 411 near Sevierville, the Oaks Resort cabins are well placed for your Smoky Mountain vacation! These rentals feature lovely views of the beautiful East Tennessee countryside. Better yet, this gorgeous setting can be enjoyed from covered back porches. Explore our cabins in the Oaks in Tennessee for your stay in the Smokies. Guests who stay at the Oaks Resort cabins only have a short drive to both Sevierville and Pigeon Forge. In addition, there are many popular attractions located nearby such as the Forbidden Caverns and Deer Farm Riding Stables. Douglas Lake is also close by for guests interested in boating near the Smoky Mountains. Closer to the Smokies, the restaurants, attractions, and shops of the Pigeon Forge Parkway are only a short drive away. Gatlinburg and the national park are also easy to reach for day trips exploring the wonders of the Great Smoky Mountains! These cozy log cabins in Tennessee offer plenty of opportunities for relaxing during your vacation. With hot tubs on porches and jacuzzis in cabin bedrooms, you are bound to enjoy unwinding in these soothing locations. Also, these cabins with game rooms and pool tables offer plenty of in-cabin entertainment. Practical features such as a kitchen and washer/dryers ensure that you can enjoy a comfortable stay. When you book online with Cabins USA Gatlinburg, you will receive our special lodging discount! 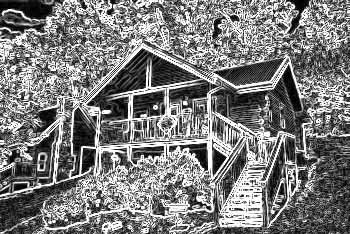 Enjoy a discount of 15% off of your cabin rental in the Smokies. Book today and earn excellent vacation savings!